, reaching the record levels of valuation. The global stock markets have reached the valuation levels last seen just before the crash of the 1987. The bonds, especially the junk bonds have rallied. The only word to describe this all is mania. And yet, warnings of the highly increased likelihood of a market crash and its repercussions for the global economy remain muted. This is perplexing. Is it that all the lessons from the previous market crashes in highly levered environments are forgotten? First, it should be reminded that the structure of the global economy is not stable as we have warned several times (see. e.g, this, this , this and this). The exceptionally high asset valuations and debt levels have been tolerable due to the exceptionally low interest rates and the artificial liquidity supplied by the central banks’ asset buying programs (QE, etc.). But now the tide is about to turn (see Figure 1). 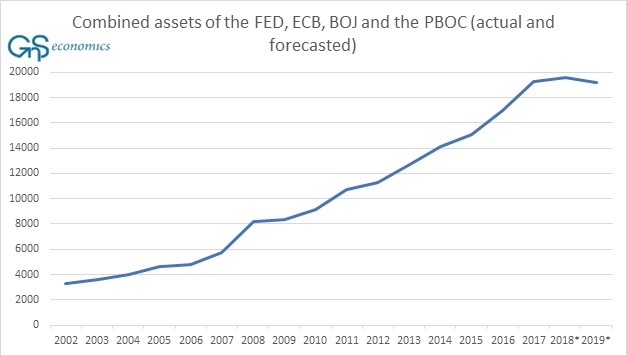 In 2018, the flow of liquidity from the central banks to the global economy is expected to level off and in 2019, for the first time ever, the combined balance sheet of the major central banks is expected to decline. Why are the central banks tightening? The reason is the same as after all periods of monetization in history. In theory, the central banks could go on financing governments and asset markets indefinitely, but this would completely mess up the allocation of capital. In simple terms, this says that the monetary authority cannot add artificial money into the economy without destroying the pricing mechanism, which has effectively already happened in the asset markets. The central banks have been very late to wake up to the financial monster they have created, but it seems that the alarm has been finally heard. The central banks now try to eliminate their support from the capital markets as gently and quietly as possible for not to bring them down. Unfortunately, they are unlikely to succeed as the flow of the liquidity from their QE-programs has supported the markets and dictated their upward direction for such a long time. When the Fed started its quantitative tightening, it also activated the clock for the asset market correction. The other central banks will follow, and this will remove the crucial support from the asset markets. Secondly, the investors have become complacent in the sense that they are assuming that the markets will continue their relentless upward march. But, like all stories that are too good to be true, this, too, is a dangerously fictitious narrative. It is an open question for how long the markets shall continue upwards without the support of the central banks, but a serious market correction is coming for sure. If it cascades as a full-blown asset market crash, as we predict, its repercussions for the global economy will be severe. While the stock market mania has received some attention, the gravest dangers may actually lie in the bond markets. The yields of the junk bonds have fallen to level not seen since the height of the financial engineering boom in 2007 (see Figure 2). Because this downward trend has been driven by QE:s of the central banks, the risk associated with the junk bonds is incorrectly priced. 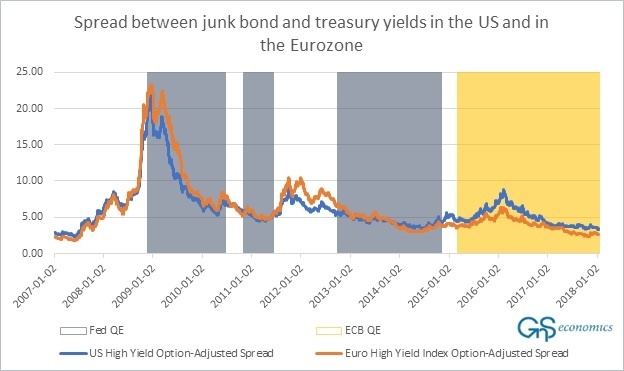 Also, while the stock markets are (mostly) liquid, the liquidity is much tighter in the junk bond markets. When the run through the very narrow door in the over-bought junk bond market begins, many bondholders will get crushed in the exit. Fire-sales are likely to ensue, which can easily reach the investment-grade bonds. The ongoing asset market mania was set in motion by the central banks. They have provided extremely easy credit (zero or negative interest rates), flooded the capital markets with artificial liquidity (QE) and supported the equity markets through direct and indirect purchases (see SNB and BoJ). The central banks thus effectively socialized the market risk and lulled the market players to believe on ever-increasing returns. In response, the investors have levered and risked up. This made the markets and the global economy extremely vulnerable to asset price corrections and rises in the interest rates. The suspicious role of the central banks makes predicting the exact turning point of the asset markets practically impossible. Even without the central bank support, the market manias can last surprisingly long. Regardless of this, even in the current manipulated market environment, the old truth, “what goes up, must come down”, still holds. With the valuations of all asset classes breaking records, their inevitable fall may break all previous records as well. To remind, the peak-to-through record for the S&P 500 is a fall of 86 % (from September 1929 to June 1932).